In Seoul, South Korea, Jason Park is being tortured. Park says “today” which makes his captor run into another room. American military officers are waiting in the back room. The captor relays the one-word message. An officer calls Eric Rayburn, a man who works at the National Security Agency. President David Palmer and his son, Keith, are relaxing on the waters of Lake Oswego in Oregon. As they fish, Keith comments that his mom is going through a hard time right now. A Secret Service agent interrupts their peaceful retreat by informing the President that they have a situation. Kim Bauer is just waking up and getting dressed when Megan Matheson, a nine-year old girl, runs into her bedroom. Megan and her father, Gary, are playing a game of hide-and-seek. Gary inappropriately stares at Kim, who is Megan’s nanny. David apologizes to his son for cutting their fishing trip short. Keith is understanding. David is escorted to a car. One of his advisors hints that the matter is urgent. At CTU in Los Angeles, Paula Schaeffer, a new programmer, brags to Tony Almeida and George Mason about her software upgrades. Michelle Dessler, a CTU employee, interrupts their conversation. 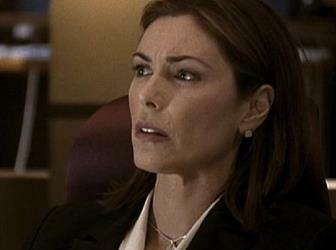 Michelle informs Mason that Rayburn just called and wants Jack Bauer to be re-activated. Palmer is led to the Northwest Regional Operations Complex where he is met by Rayburn. David still wants to stick to his original itinerary for the day. Rayburn explains the situation to David and his chief aide, Lynne Kresge. Rayburn explains that a terrorist group is planning on setting off a bomb in Los Angeles sometime today. NSA had been tracking Jason Park and from surveillance, noticed that Park was standing near the suicide bomber Mamud Rashed Faheen. Everyone thought that Faheen had been killed by an earlier bombing. Rayburn adds that they recently learned about a nuclear bomb headed for Los Angeles. Faheen is connected to a terrorist cell called Second Wave, a fairly unofficial group. There is only one country that is somewhat affiliated to Second Wave. David asks to speak to that country’s Prime Minister over the phone. Carla, Megan’s mother, is making breakfast for Gary. Gary hugs his wife tightly. Gary kisses Carla, which makes Kim feel awkward. Carla leaves the room. Gary makes an out-of-line comment about Kim’s body. David talks to the Prime Minister. The PM says that he isn’t affiliated with Second Wave. David warns that he knows that the Prime Minister’s country supports Second Wave. The President is worried about a possible terrorist attack and explains the situation to the PM. Palmer threatens that they will retaliate if a bomb detonates on American soil. The Prime Minister doesn’t like threats and comments that Palmer needs to proceed with caution. Kim watches as Megan roller-blades in the Matheson driveway. Jack pulls up by the curb. Jack, who is thinner, unkempt, and growing a beard, watches in admiration. Jack suddenly gets a call. It is from George’s office. Jack explains that he no longer works at CTU and hangs up. Jack approaches the driveway. Kim is surprised to see her dad. Jack wants to know why Kim has been avoiding him. Kim admits that it is hard to be around Jack because she is reminded of her mom’s death. Kim tells Jack that she needs time to heal before they can spend any time together. Megan yells from the balcony, which is Kim’s cue to say goodbye to her father. At the Operations Complex, Rayburn suggests calling the Pentagon. David is unsure how to respond and tells Rayburn that he isn’t ready to make a decision. Reza Naiyeer is driving when he suddenly pulls up to the Warner house in the San Fernando Valley. Reza is speaking Arabic into his cell phone. Reza walks up to his fiancee, Marie Warner, and kisses her. They are to be married later in the day. Marie’s sister, Kate, and her father, Bob, are helping with wedding preparations. Kate has reservations regarding Reza. Bob thinks that Kate is overreacting. Mason calls Rayburn and explains that he can’t get a hold of Jack. Rayburn wants Jack to be brought in immediately. Jack returns home to a house full of unopened boxes. Jack hears Tony leave a message for him on the answering machine. Jack drinks from a glass of water. Jack opens a desk drawer and notices his gun. Jack grabs a picture of his family. Jack lays down on the couch with the frame in his arms. Jack gets a call from the White House. Instinctly, Jack picks up the phone and is instantly connected to the President. David asks how Jack has been doing. Jack admits that he is going through a tough time. David explains that he needs Jack’s help. Jack stresses that he has been inactive for over a year. David says that the situation is dire. David wants Jack to head to CTU and listen to the details of the matter. David adds that he trusts Jack to the fullest extent. Kim notices that Carla has returned home. Carla is busy wrapping a gift for Gary’s assistant. Carla is acting agitated so Kim offers to help. Carla comments that Gary is finicky when it comes to her gift-wrapping. Michelle talks to Tony about an alert that came up on her computer. Paula interrupts. Paula thinks that something major is about to happen. Michelle tells Paula to chill. Mason updates the CTU staff about the nuclear bomb in Los Angeles. Mason insists that no one outside of CTU should be alerted to the situation. Tony is worried that he hasn’t been able to get in touch with Jack. Mason thinks that they will need Jack’s expertise regarding the terrorist situation. David, Rayburn, and the other aides talk about the nuclear bomb and projected casualty numbers. The casualties could reach 2 million. David doesn’t want to speak to the media yet. Rayburn insists, but David puts his foot down about the matter. The meeting is adjourned. A man named Marko arrives at an abandoned warehouse. He speaks to a man at the door. Once inside, Marko asks about the bomb. One man says that the bomb will be ready soon. People are working on the bomb in a heavily guarded area in the building. Tony needs Paula’s help, but she is acting distant. Paula discloses that she feels overwhelmed. Tony says that she is the best programmer that they have. Paula agrees to stay focused on the problem at hand. Jack Bauer is led into CTU. Everyone stops to look at him. Tony says hello and shakes Jack’s hand. Paula and Michelle are waiting in George’s office. Jack and Tony walk in. George explains the situation to Jack. Jack is unwilling to help and walks out. Jack calls Kim. Jack wants the two of them to leave Los Angeles immediately. Kim hangs up on him. Jack calls her back, but Kim won’t answer. Jack leaves a message for Kim to go to her aunt’s house. Tony confronts Jack and tells him that CTU needs his help. Jack brings up that CTU was unable to protect Teri. Jack doesn’t want to lose his daughter too. Jack leaves CTU. Jack calls Kim’s aunt and leaves a message. Back in Mason’s office, George is mad that Jack won’t cooperate. To everyone’s surprise, Jack returns. Jack has one condition: Kim needs to leave the city ASAP. Jack wants to be updated about the terrorist cells. George says that a man named Joseph Wald is connected to Second Wave. Jack remembers Wald because he was working undercover at the time when Wald was arrested. George explains that Wald is out of jail on trial but can’t be located. Jack suggests bringing in Marshall Goren, a key witness. Mason is uneasy with Jack’s plan, but agrees to call the FBI. At the Warner home, the engaged couple discuss wedding plans. Kate makes a comment. Reza gets defensive. Marie breaks up the disagreement. Kate gets a call so she goes inside the house. On the phone is Ralph Burton, a PI hired to run a background check on Reza. Ralph explains that Reza’s business dealings are on the up-and-up but that he has a connection to a terrorist named Syed Ali. Ralph explains that Reza had legitimate financial deals with Ali. Kate is horrified. Lynne tells David that he has a conference call lined up to speak to the Joint Chiefs of Staff. David comments that he didn’t sign off on the call. David confronts Rayburn. Rayburn admits that he set up the call but isn’t trying to undermind the President. David is mad at Eric for not minding his own business. Michelle creates a false background for Jack’s cover while he deals with Goren. Mason has Goren sent in to his office. Goren is uncooperative and says that he already has a deal with the FBI. Jack suddenly shoots Goren in the chest. Mason is shocked. Jack checks Goren’s pulse. Jack explains to George that they need to get answers. Jack asks Mason for a hacksaw. Kim is keeping an eye on Megan in her bedroom. Kim looks out the window and sees Gary pull up in the driveway. Kim and Megan can hear Gary and Carla arguing downstairs. Carla begins to cry. Megan appears frightened. Kim locks the door so Gary can’t enter. Gary knocks on the bedroom door. After a few seconds, Kim opens it and makes up a story that she was busy washing Megan’s hair. Megan has a towel wrapped around her head. Gary inquires about what they heard. Kim plays stupid and says that they didn’t notice any sounds. Gary implies that Carla had an accident. Gary wants Kim to check on Carla, but Kim notices that Megan is afraid of her father. Gary pushes Kim and she falls down. Gary replies that he could easily hurt Kim. Megan begins to cry and runs to Kim for protection. Gary reaches for Megan, who hits her head on the bed. Gary’s phone begins ringing. He answers it to discuss business. At CTU, Jack, who has just shaved off his beard, stares at himself in the mirror.